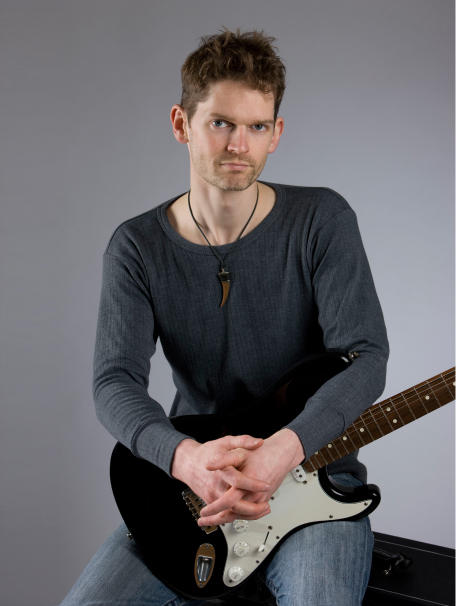 Guitar lessons near Isleworth are available from professional guitar teacher Stuart Bahn. Stuart teaches a wide range of guitar styles to a high level. He has many years of experience and provides you with everything you need to develop your guitar playing to a high level. You can learn rhythm guitar, how to solo, how music works, how to improve your technique, how to play classical pieces, and much more. For more about all the different skills you can learn with Stuart by viewing the lesson content page. Travelling to you guitar lesson with Stuart from Isleworth is easy. 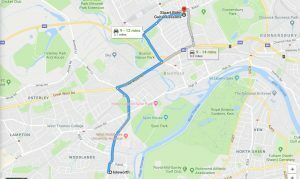 It’s a 10-minute drive or a short trip by bus or tube. 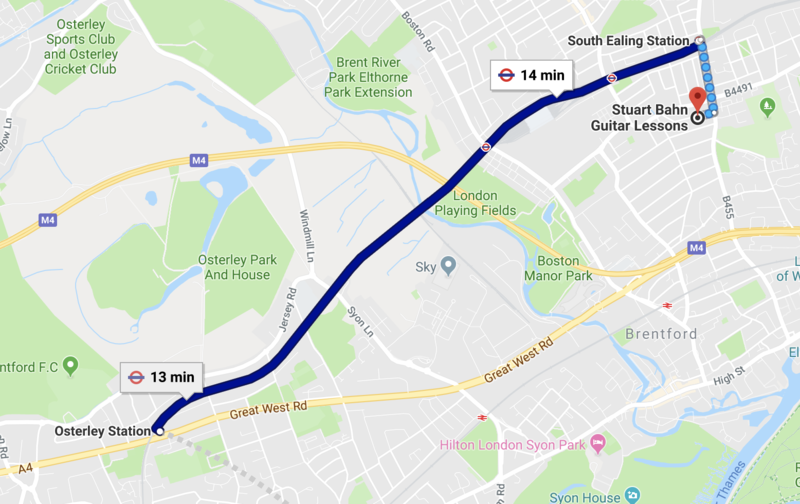 Guitar lessons take place at Stuart’s home in South Ealing, which is on the Piccadilly Line and the H91 bus route. You’ll find travel details below. 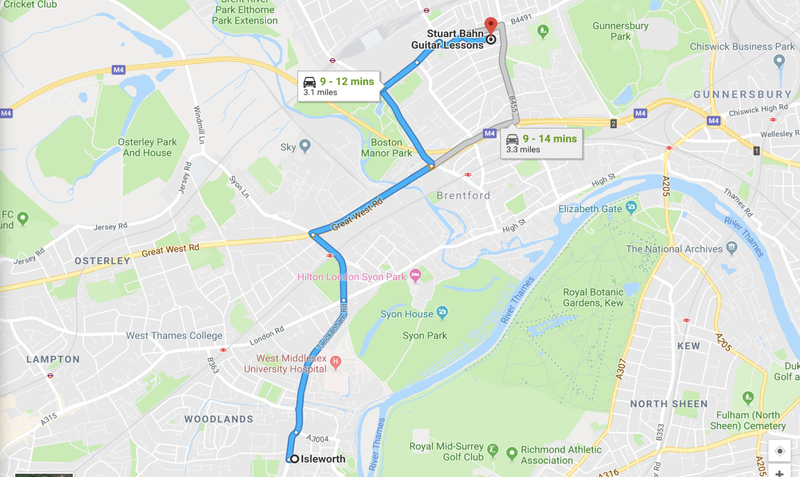 To get to your guitar lesson with Stuart from Isleworth by car, you should head north up Twickenham Road until you reach the A4. 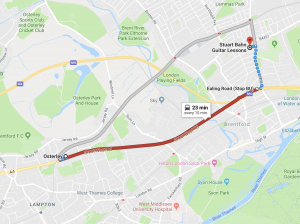 Once on the A4, head east and then enter take Boston Manor Road followed by Windmill Road, or take South Ealing Road. 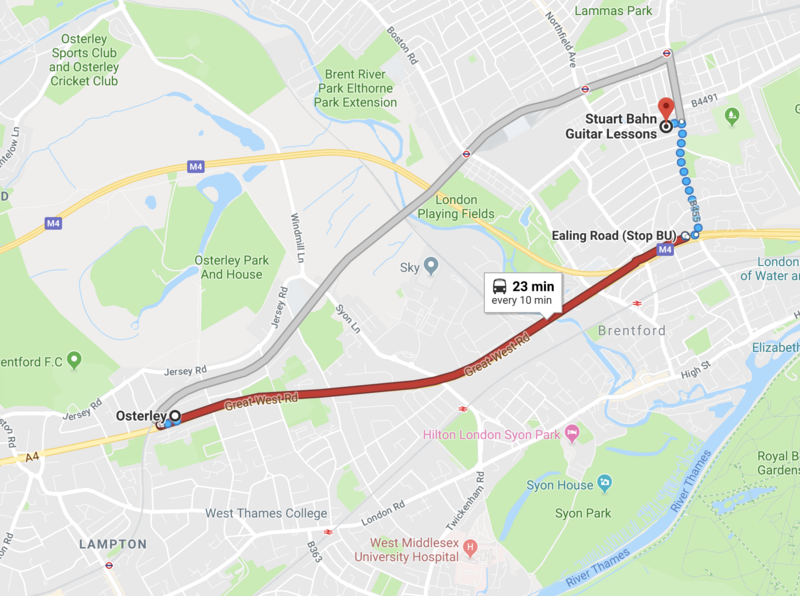 Both routes will take you to Chandos Avenue where your guitar lessons take place. If driving to your guitar lesson from Isleworth you can usually park on Chandos Avenue. Parking is free anytime in the week except for 3-4pm. 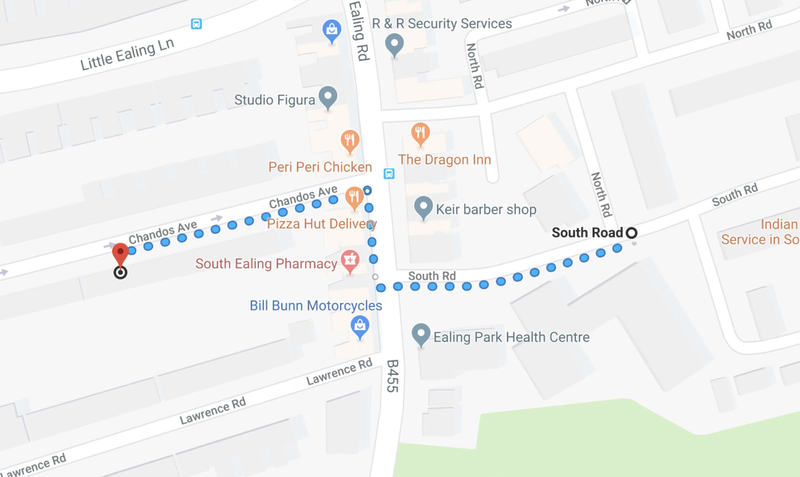 During this time you can park on South Road which is just across South Ealing Road, as shown below. At the weekend you can park on Chandos Avenue regardless of what time your guitar lesson is. To get to your guitar lessons from Isleworth by bus the best option is to take the H91, however the tube may be a better option. 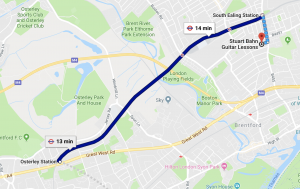 You can get the H91 bus from Osterley, which is close to Isleworth, along the A4 to the junction with Ealing Road. From here it’s a moderate walk to Chandos Avenue. 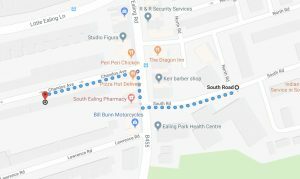 Allow 10 minutes before your guitar lesson time to walk from the bus stop to Chandos Avenue. To get the tube from Isleworth to your guitar lesson, the best option is to go from Osterley tube station. This is located on the A4, about a mile from Isleworth. From Osterley, take the Piccadilly Line east, two stops to South Ealing station. From here it’s just a five-minute walk south to Chandos Avenue, where your guitar lessons with Stuart take place.